Julie Sirrs is a former DIA agent who made four trips to Afghanistan during the Taliban regime, two when she was with DIA. To discuss conditions of Afghanistan in that period and the alliance of the Taliban with Osama bin Laden, Julie Sirrs accepted our request for an interview, which we are offering today our readers. We would like to thank Julie Sirrs for her kindness and willingness to help. Undicisettembre: What can you tell us about the time you spent in Afghanistan as a DIA agent? What was your duty there? Julie Sirrs: I made two trips to Afghanistan while I was with DIA, but both of those trips were on my own time, in other words DIA did not send me there officially. The second time that I went there had been some discussion about having that be a work-related trip, but for bureaucratic reasons that wasn’t able to be put in place before I went. Of course I used the information that I learned on both trips in my job at DIA. Undicisettembre: Being there privately and not officially, who did you communicate to the information you got while you were there? Julie Sirrs: I didn't really communicate with anyone regarding the information I was gathering while I was there. I waited until I got back and wrote reports from my notes. There weren't a lot of means of communication in Afghanistan at the time, it was before cellphones; there were occasional satellite phones but I generally didn't use those except occasionally just to let people know that had I arrived and that I was safe, that sort of thing. While I was there I just gathered my own information. People I coordinated with to get into Afghanistan knew that I worked for the government, particularly my second trip when I traveled to areas held by the United Front, better known as the Northern Alliance, some of them had even met with me at the Defense Intelligence Agency so they knew who I was but they also knew I wasn't going there on any official trip. Undicisettembre: How was Afghanistan under the Taliban? What struck you most? Julie Sirrs: There was a sense among many in the United States at the time, in the Government or people who specialized in Afghanistan in the private sector, that the Taliban were welcomed by many Afghans because they restored order and they were not corrupt and even if they were harsh in their interpretation of Islam they had some good qualities. So what struck me in particular the first time I went to Afghanistan, and that was the only time I went into Taliban areas, was that the Taliban did not seem to be appreciated by the population. During that trip I traveled over land from the Pakistani border to Kabul and then to the outskirts of Kabul and a town called Paghman. I sensed in all of those places people were afraid of the Taliban, the Taliban were very arrogant, they were seeking bribes. On the day that I left I saw people had been executed and hanged, they were still there for everyone to see. Their rule was very harsh and frightening. Even the ethnic Pashtuns, with whom I was traveling, had fear of the Taliban. I got much more of an impression that the Taliban were not the somewhat positive force that I think some people in Washington wanted to believe at the time and that was the main impression that struck me. But even then in 1997 you could see the Taliban being very close with radical Islamist Arabs and having invited them into Kabul allowing them to take control over certain areas, these Arabs later became known for being affiliated with bin Laden and al-Qaeda. That was evident even in 1997, not long after Osama bin Laden had sought refuge with the Taliban in Afghanistan. Undicisettembre: How was the condition of women under the Taliban? Julie Sirrs: It was very bad. When I was in Kabul and those areas and I was traveling with a family, so there were some men and some women, all of us women were of course covered up in a chadri. At one point there were ten of us packed into a car taking a driving tour of Kabul, there was one street we tried to go down and were stopped by a Taliban soldier who said the car was not allowed to go down that street because there were women in the car. The Taliban would have this sort of police force and if they could see a woman's socks through her veil she would be beaten openly in the market place. The population was very fearful and the conditions were very bad especially for women. Even in this house where I stayed one of the children wanted a doll and I remember they were told they couldn't have one because the Taliban had banned them because they were un-Islamic. It was a bad time. Undicisettembre: How was as far as you know the relationship between al-Qaeda and the Taliban? Julie Sirrs: This is something I studied professionally and I think it was very good from very early on, I think they had a lot in common and the Taliban were more anti-western from the very beginning than it was generally understood at the time, so they very naturally fell in with bin Laden and al-Qaeda and their shared aims. Al-Qaeda and bin Laden saw the Taliban to be a real ally and were willing to help the Taliban with their goals in Afghanistan and central Asia in general. In Afghanistan specifically they would help the Taliban in their fight against the anti-Taliban resistance particularly the one led by Ahmad Shah Massoud. 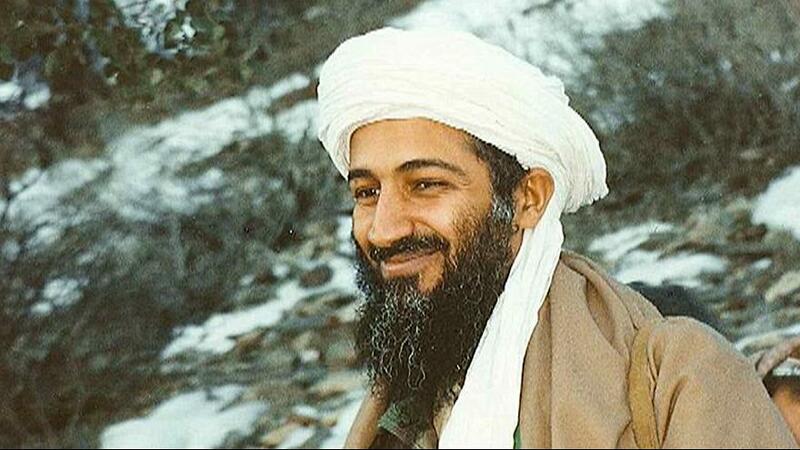 Bin Laden very early on assisted the Taliban with additional funds and his own Arab fighters and of course he was involved in the assassination of Massoud which was considered helpful by the Taliban. In turn the Taliban gave bin Laden a sanctuary not simply because he was a Muslim and a guest of theirs but also because they believed in his ideology and wanted to work with him. 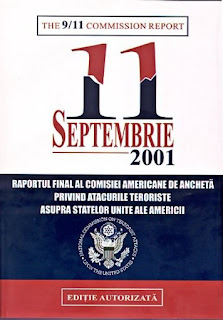 Undicisettembre: Could 9/11 have been avoided, in your opinion, if the different agencies communicated better between each other? Julie Sirrs: I think it’s possible and it was also well documented by the 9/11 Commission. 9/11 might have also been avoided if American policy makers better understood the Taliban and their alliance with al-Qaeda and if the United States, rather than trying to remain neutral in Afghanistan, had instead provided better support to those who were fighting against the Taliban, in some ways as simple as diplomatic support or even funding. So I'm not in any way talking about US troops on the ground or anything like that but just providing more support and making it clear the United States was against the Taliban. I think that would have made it harder for the Taliban to hold the areas they did and it would have made it harder for bin Laden to have a secure safe haven in Afghanistan and without that it would have been harder for him to plan and implement the 9/11 attacks like he did. Undicisettembre: During your time at DIA you also interviewed some captured al-Qaeda operatives. What can you tell us about them? Julie Sirrs: These were individuals who had been caught by the Afghans who were fighting with Massoud’s forces, they were considered initially Taliban fighters and then it was realized they were not Afghans. Many of them were Pakistani, largely Pushtun madrassah students from northwestern Pakistan, but many of them were older, like in their thirties and up and weren’t Pushtuns but Punjabis, possibly official Pakistanis of some sort in the military or intelligence or recruited by them outside the madrassah network. There were also some individuals from China, the Uighur areas, and Arabs, I remember particularly people from Yemen. There were even prisoners from some for the former Soviet central Asian countries, but I never directly interviewed them. Undicisettembre: What relevant information did you get from them? Julie Sirrs: These weren’t the stereotypical foreign fighters I might have expected to see, the Pakistanis in particular. I learned about their networks, how some of these people would go into Pakistan and how they would be funneled to Afghanistan. Some of them were from madrassahs in various places in Pakistan but some of the network was outside of that. There seemed to be a pretty organized effort to get foreigners to Afghanistan to be fighting on behalf on the Taliban. 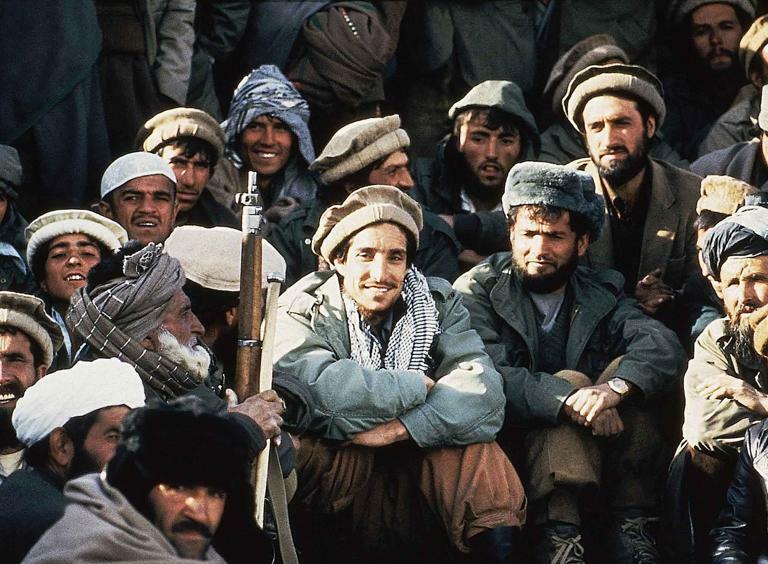 Some of those people were told they were going to fight actual American or Russian troops or foreign fighters on the other side in Afghanistan; but when they got there and realized they were just fighting other Afghans and relatively devout Muslims some of them were disillusioned. Some others were still very ideological and even though the Muslims they were fighting on the other side of them were very conservative they still thought they were too liberal and they should die for something as minor as wearing western style pants. So these prisoners wanted to be released to continue the fight wherever they could. Undicisettembre: What do you think of the use of torture during the so called War on Terrorism? 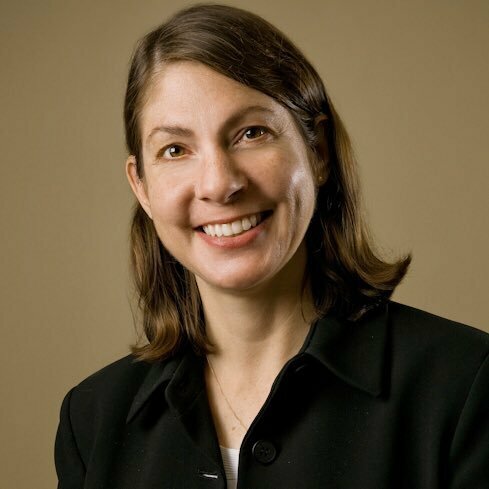 Julie Sirrs: Personally I’m opposed to it, in part morally, but also I don’t think it’s effective. I think when people are tortured they are inclined not to give accurate information; they’ll say whatever they think the person wants to hear. I also think from an operational security perspective if someone important gets captured, someone who might have good information, the capture of that person is generally pretty quickly known by the others in his organization, so they very likely change their plans as a result, so even the information that might have been valuable is no longer valuable. So, I don’t think it accomplishes very much and in a larger sense makes it difficult to try to appear as a force for good in places like Afghanistan when that’s the reputation that you develop. 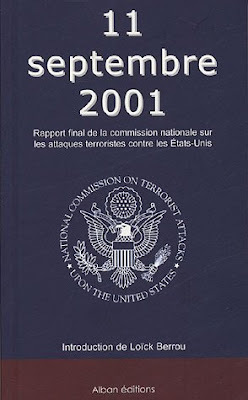 Undicisettembre: In your opinion would it have been possible to catch Osama bin Laden before 2011? Julie Sirrs: I think so. We tried to some extent in terms of having open lines of communication with the Afghans in the Northern Alliance and particularly those who were most active in Afghanistan, those surrounding Massoud. I think they had helpful information, of course they didn’t know exactly where he was but I think if those who were opposed to bin Laden, and especially the United States, would have been more supportive of the anti-Taliban fighters that would have helped to reduce the territory that bin Laden had and it would have made him more vulnerable to move around more often. I think if bin Laden had been more insecure before 9/11, that might have made it easier for us to capture him. Undicisettembre: What lead you to leave DIA at the end? Julie Sirrs: As I said my trips to Afghanistan were unofficial, I learned after I got back after my second one that some officials were upset that I had chosen to do that. I thought it was okay before I left but it turned out it wasn’t true with some people. So DIA ultimately decided to revoke my security clearance which meant that I wasn’t able to work there anymore. So officially I resigned but basically they wanted me pushed out. I heard that some people at the State Department were especially unhappy about my trip and these were people among those more sympathetic with the Taliban at that time, so there might have been some political reasons as well, but ultimately I was forced to leave. Undicisettembre: What do you think of conspiracy theories according to which 9/11 was an inside job? Julie Sirrs: Of course I don’t give them any credibility, I think maybe people who think this don’t understand all the events leading up to it. Terrorists had targeted the World Trade Center before, they were launching an increasing number of increasingly sophisticated attacks, from the Cole bombing to the two embassies bombing. They got lucky in terms of the destruction they were able to cause but it’s not that surprising in some ways. It was clear bin Laden was continuing to plot attacks against Americans. The exact details and the nature of the attack caught a lot of people by surprise including myself, but I think in terms of the whole context of what was going on in Afghanistan and Africa against al-Qaeda it wasn’t that surprising. But people who were less familiar with that and less knowledgeable about it are more inclined to believe conspiracy theories. Undicisettembre: What do you think of communication between intelligence agencies today? Does it work better now than before 2001? Julie Sirrs: I don’t have any direct experience since I left DIA before 2001 but my understanding is there really had been an effort to improve communications and I also think some agencies, for example the FBI, have gotten more involved in countering terrorism and being directly involved in those sorts of issues than they were before 9/11, so I think they have been increasing their own expertise and that surely helps. Undicisettembre: You are now a lawyer, right? Did you have to readjust your life when switching from being a DIA agent to being a lawyer? Julie Sirrs: Well, no. After I left DIA I went to work for a small group that was made up of other former intelligence personnel and that was a natural transition, but eventually I wanted to do something different so I chose that. But I do think some of the same skills are helpful, at times you are sort of investigating. I deal with a lot of different types of people as a lawyer just as I dealt with a lot of different types of people when I was with the DIA in the United States and overseas. It’s different, but it has been a good transition and sometimes I’m surprised by how much I use the same skills. Julie Sirrs è un'ex agente della DIA che ha compiuto quattro viaggi in Afghanistan durante il regime dei Talebani, di cui due durante il periodo in cui lavorò alla DIA. Per parlare delle condizioni dell'Afghanistan in quel periodo e dell'alleanza tra i Talebani e Osama bin Laden, Julie Sirrs ha accettato la nostra richiesta di un'intervista che offriamo oggi ai nostri lettori. Ringraziamo Julie Sirrs per la sua cortesia e disponibilità. Undicisettembre: Cosa puoi dirci del tempo che hai passato in Afghanistan da agente della DIA? Che incarico avevi? Julie Sirrs: Ho fatto due viaggi in Afghanistan mentre lavoravo per la DIA, ma entrambi erano al di fuori del mio lavoro, in altre parole la DIA non mi mandò li ufficialmente. La seconda volta che ci andai ci furono delle discussioni sulla possibilità di renderlo un viaggio di lavoro, ma per motivi burocratici non fu possibile raggiungere un accordo prima che io ci andassi. Ovviamente usai le informazioni che acquisii durante entrambi i miei viaggi per il mio lavoro alla DIA. Undicisettembre: Essendoci stata in via non ufficiale, a chi comunicavi le informazioni che raccoglievi mentre eri lì? Julie Sirrs: In realtà non comunicavo con nessuno a riguardo delle informazioni che raccoglievo mentre ero lì. Aspettai fino al mio ritorno per scrivere rapporti dai miei appunti. Non c'erano molti mezzi di comunicazione in Afghanistan a quel tempo, era prima dei telefoni cellulari; saltuariamente si trovavano telefoni satellitari ma di solito non li usavo se non raramente solo per far sapere che ero arrivata e che stavo bene, cose di questo genere. Mentre ero lì semplicemente raccoglievo informazioni per me stessa. Le persone con cui mi ero coordinata per entrare in Afghanistan sapevano che lavoravo per il governo, in particolare nel mio secondo viaggio quando andai in aree sotto il controllo dello United Front, meglio noto come Alleanza del Nord, avevo anche incontrato alcuni di loro alla Defense Intelligence Agency quindi sapevano chi ero ma sapevano anche che non sarei andata lì in un viaggio ufficiale. Undicisettembre: Com’era l’Afghanistan sotto i Talebani? Cosa ti colpì di più? Julie Sirrs: C'era un sentore tra molti negli Stati Uniti al tempo, nel governo o tra persone che erano specializzate nell'Afghanistan nel settore privato, che i Talebani fossero benvenuti da molti afghani perché avevano ripristinato l'ordine e perché non erano corrotti e anche se erano molto rigidi nella loro interpretazione dell'Islam avevano buone qualità. Quindi ciò che mi colpì in particolare la prima volta che andai in Afghanistan, e fu l'unica volta che andai in aree controllate dai Talebani, fu che i Talebani non sembravano essere apprezzati dalla popolazione. Durante quel viaggio passai via terra attraverso il confine con il Pakistan fino a Kabul e poi nella periferia di Kabul e una città chiamata Paghman. Mi resi conto in tutti quei posti che le persone avevano paura dei Talebani, che i Talebani erano molto arroganti, che chiedevano pagamenti illegali. Il giorno che me ne andai vidi che alcune persone erano state uccise e impiccate, erano ancora lì affinché chiunque potessi vederle. Il loro governo era molto duro e spaventoso. Anche i pashtun con cui viaggiavo avevano paura dei Talebani. Ebbi la forte impressione che i Talebani non fossero la forza in qualche modo positiva che penso alcune persone a Washington volessero credere al tempo e quella fu la prima impressione che mi colpì. Ma anche allora nel 1997 si vedeva che i Talebani erano molto vicini agli arabi islamisti radicali e li avevano invitati a Kabul concedendo loro di prendere il controllo di alcune aree, questi arabi in seguito divennero noti per essere affiliati con Osama bin Laden e al-Qaeda. Questo era evidente nel 1997, non molto dopo che Osama bin Laden chiese rifugio ai Talebani in Afghanistan. Undicisettembre: Com’era la condizione delle donne sotto i Talebani? Julie Sirrs: Era pessima. Quando ero a Kabul e nelle zone limitrofe e viaggiavo con una famiglia, quindi c'erano sia uomini sia donne, tutte noi donne ovviamente eravamo coperte da un burqa. A un certo punto eravamo in dieci su una macchina e stavamo facendo un giro in auto per Kabul, c'era una strada che volevamo percorrere ma fummo fermati da un soldato Talebano che ci disse che la macchina non poteva percorrere quella strada perché c'erano delle donne in macchina. I Talebani avevano questa specie di forze di polizia e se vedevano le calze di una donna attraverso il velo l’avrebbero picchiata pubblicamente nella piazza del mercato. La popolazione aveva molta paura e le condizioni erano molto negative specialmente per le donne. Anche nella casa in cui stavo una delle bambine voleva una bambola e ricordo che le dissero che non poteva averne una perché i Talebani le avevano vietate perché erano contrarie all'Islam. Erano tempi duri. Undicisettembre: Per quanto ne sai com'erano le relazioni tra al-Qaeda e i Talebani? Julie Sirrs: Questa è una cosa che ho studiato professionalmente e credo che fossero molto buone fin da subito, penso che avessero molto in comune e che i Talebani erano più antioccidentali sin dall'inizio di quanto generalmente venisse compreso a quel tempo, quindi molto naturalmente andavano d'accordo con bin Laden e con al-Qaeda e avevano obiettivi in comune. Al-Qaeda e bin Laden vedevano nei Talebani un vero alleato e volevano aiutare i Talebani con i loro scopi in Afghanistan e in generale nell'Asia centrale. In Afghanistan nello specifico aiutavano i Talebani a combattere contro la resistenza antitalebana e in particolare quella guidata da Ahmad Shah Massoud. Bin Laden fin da subito aiutò i Talebani con fondi addizionali e con i suoi stessi combattenti arabi e ovviamente fu coinvolto nell'assassinio di Massoud che fu considerato utile dai Talebani. In cambio i Talebani diedero a bin Laden un rifugio non solo perché lui era un musulmano e un loro ospite ma anche perché credevano nella sua ideologia e volevano lavorare con lui. Undicisettembre: Credi che l’11/9 avrebbe potuto essere evitato, se le varie agenzie avessero comunicato meglio tra loro? Julie Sirrs: Credo che sarebbe stato possibile ed è stato anche ben documentato dalla Commissione sul’11/9. L’11/9 avrebbe potuto essere evitato se i responsabili politici americani avessero capito meglio chi erano i Talebani e la loro alleanza con al-Qaeda e se gli Stati Uniti, anziché rimanere neutrali in Afghanistan, avessero al contrario fornito migliore supporto a coloro che stavano combattendo contro i Talebani, in modi semplici come un supporto diplomatico o anche con dei finanziamenti. Quindi non sto parlando in alcun modo di mandare truppe americane a terra o niente del genere ma di fornire maggiore supporto e di chiarire che gli Stati Uniti erano contrari ai Talebani. Penso che questo avrebbe reso più difficile per i Talebani tenere il controllo di alcune aree come hanno fatto e avrebbe reso più difficile per bin Laden avere un rifugio sicuro in Afghanistan e senza questo sarebbe stato più difficile per lui pianificare e realizzare gli attacchi dell'11/9 come ha fatto. Undicisettembre: Durante il tuo periodo alla DIA hai anche interrogato dei membri di al-Qaeda che erano stati catturati. Cosa puoi dirci di loro? Julie Sirrs: Erano persone che erano state catturate dagli afghani che combattevano con le forze di Massud, inizialmente pensavamo che fossero combattenti talebani ma poi capimmo che non erano afghani. Molti di loro erano pakistani, in gran parte studenti di madrase pashtun del nord-ovest del Pakistan, ma molti di loro erano anche più vecchi, oltre i trent'anni e non erano pashtun ma punjabi, forse ufficiali pakistani di qualche rango nell'esercito o nell'intelligente del Pakistan o reclutati da loro al di fuori della rete delle madrase. C'erano anche delle persone dalla Cina, dalle aree uiguri, e arabi, ricordo in particolare persone dallo Yemen. C'erano anche prigionieri di alcune delle nazioni post sovietiche dell'Asia centrale, ma non li interrogai direttamente. Undicisettembre: Quali informazioni importanti hai acquisito da loro? Julie Sirrs: Non erano i tipici Foreign Fighters che mi sarei aspettata, in particolare i pakistani. Scoprii cose riguardo alle loro reti, come queste persone entravano in Pakistan e come venivano trasferite illegalmente in Afghanistan. Alcuni di loro venivano dalle madrase in varie zone del Pakistan ma parte della rete al di fuori da tutto ciò. Sembrava che ci fosse uno sforzo ben organizzato per far entrare degli stranieri in Afghanistan affinché combattessero insieme ai Talebani. Ad alcune di queste persone veniva detto che avrebbero combattuto effettivamente le truppe americane o russe o dei Foreign Fighters dall'altra parte dell’Afghanistan; ma quando arrivavano e scoprivano che in realtà stavano combattendo contro altri afghani e musulmani relativamente devoti alcuni di loro furono delusi. Qualcun altro rimaneva legato alla propria ideologia e anche se stavano combattendo contro altri musulmani che erano molto conservativi credevano comunque che fossero troppo liberali e che dovessero morire per qualcosa di così poco importante come indossare pantaloni occidentali. Quindi questi prigionieri volevano essere rilasciati per poter continuare il loro combattimento dovunque potevano. Julie Sirrs: Personalmente sono contraria, in parte moralmente, ma anche perché non credo che sia efficace. Penso che quando le persone vengono torturate siano portate a non dare informazioni accurate; diranno qualunque cosa pensano che l'interrogatore voglia sentire. Credo anche che da un punto di vista della sicurezza operativa se qualcuno importante viene catturato, qualcuno che può avere delle buone informazioni, la cattura di quella persona è generalmente nota in poco tempo dagli altri nella sua organizzazione, quindi è molto probabile che cambieranno i loro piani di conseguenza, quindi anche un'informazione che avrebbe potuto essere valida non è più valida. Quindi non credo che sia molto utile e in generale rende più difficile apparire come una forza per il bene comune in posti come l'Afghanistan quando questa è la reputazione che si vuole ottenere. Undicisettembre: Pensi che sarebbe stato possibile prendere Osama bin Laden prima del 2011? Julie Sirrs: Credo di sì. Abbiamo cercato in un certo senso di avere linee aperte di comunicazione con gli afghani dell'Alleanza del Nord e in particolare quelli che erano più attivi in Afghanistan, quelli vicini a Massoud. Credo che avessero informazioni utili, ovviamente non sapevano esattamente dove si trovava ma credo che se coloro che erano opposti a bin Laden, e specialmente gli Stati Uniti, avessero dato più supporto ai combattenti antitalebani questo avrebbe aiutato a ridurre il territorio che bin Laden aveva a disposizione e lo avrebbe reso più vulnerabile e lo avrebbe costretto a spostarsi più frequentemente. Credo che se bin Laden fosse stato meno al sicuro prima dell’11/9, sarebbe stato per noi più facile catturarlo. Undicisettembre: Cosa ti portò a lasciare la DIA alla fine? Julie Sirrs: Come ho detto i miei viaggi in Afghanistan non furono ufficiali, seppi dopo il mio ritorno dal secondo viaggio che alcuni ufficiali erano infastiditi che io avessi deciso di intraprendere questo viaggio. Pensavo che andasse bene prima di partire ma risultò che questo non era vero per alcune persone. Quindi la DIA alla fine decise di ritirare la mia autorizzazione alla sicurezza che significava che non potevo più viaggiare. Quindi ufficialmente diedi le dimissioni ma sostanzialmente vollero cacciarmi fuori. Sentii che alcune persone al Dipartimento di Stato erano particolarmente scontente del mio viaggio e questi erano tra quelli che avevano più simpatia per i Talebani al tempo, quindi ci può essere stata anche qualche ragione politica, ma alla fine fui costretta ad andarmene. Undicisettembre: Cosa pensi delle teorie della cospirazione secondo cui l’11/9 è stato un inside job? Julie Sirrs: Ovviamente non do loro nessun credito, penso che le persone che credono a queste teorie non capiscano gli eventi che hanno portato fino a ciò che è successo. I terroristi hanno preso di mira il World Trade Center in passato, stavano lanciando un numero crescente di attentati sempre più sofisticati, dall'attacco contro la U.S. Cole agli attentati contro le due ambasciate. Sono stati fortunati in termini della distruzione che hanno causato ma in molti modi questo non è sorprendente. Era ovvio che bin Laden stesse continuando a tramare attacchi contro gli americani. I dettagli esatti e la natura dell'attacco presero molti di sorpresa tra cui me stessa, ma credo in termini del contesto generale di ciò che stava succedendo in Afghanistan e in Africa contro al-Qaeda che non fu una grande sorpresa. Ma le persone che non conoscono bene queste cose e che non ne sanno abbastanza sono più portate a credere alle teorie della cospirazione. Undicisettembre: Cosa pensi della comunicazione tra le agenzie al giorno d’oggi? Funziona meglio che prima del 2001? Julie Sirrs: Non ne ho un’esperienza diretta perché lasciai la DIA prima del 2001 ma per quanto ne so c'è stato uno sforzo per migliorare la comunicazione e credo che alcune agenzie, ad esempio l’FBI, siano più coinvolte dell'antiterrorismo e siano direttamente coinvolte in cose di questo tipo più di quanto lo fossero prima dell’11/9, quindi credo che abbiano migliorato le proprie conoscenze e questo sicuramente aiuta. Undicisettembre: Oggi sei un avvocato, giusto? Hai dovuto riadattare la tua vita nel passare dall'essere un’agente della DIA ad essere un avvocato? Julie Sirrs: Beh, no. Dopo che lasciai la DIA andai a lavorare per un piccolo gruppo fatto da altro personale precedentemente impiegato nell'intelligente e questa fu una transizione naturale, ma dopo decisi di fare qualcosa di diverso e quindi scelsi questo. Ma credo che alcune delle stesse capacità siano utili, alle volte devi investigare. Ho a che fare con molti tipi di persone diverse da avvocato così come avevo a che fare con molti tipi di persone diverse mentre ero nella DIA negli Stati Uniti e all'estero. È diverso, ma è stata una buona transizione e alle volte sono sorpresa da come uso le stesse capacità. di Hammer. La prima parte di questo articolo è disponibile qui. 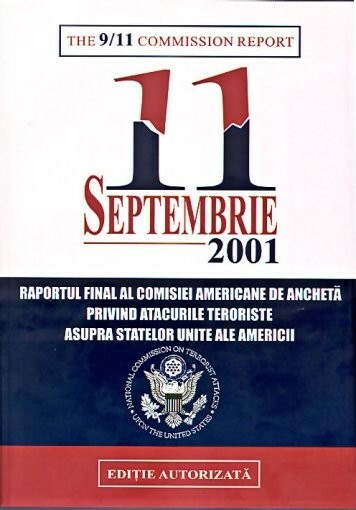 Nel 2006 la casa editrice di Bucarest Editura ALL ha pubblicato una traduzione in rumeno del 9/11 Commission Report con il titolo 11 Septembrie 2001: Raportul final al comisiei americane de anchetă privind atacurile teroriste asupra Statelor Unite ale Americii. Gli autori della traduzione sono Gabriel Tudor, Radu Trif, Lena Călinoiu, Florin Sicoie e Simona Ceauşu. Il testo è integrale, comprensivo di prefazione e note per ogni capitolo. Tuttavia manca una nota all'edizione rumena e non è quindi spiegato il motivo per cui la copertina sotto il titolo riporti la scritta Ediţie autorizată (Edizione autorizzata) sebbene il sito ufficiale della commissione chiarisca che nessuna traduzione può essere considerata ufficiale o autorizzata. La spiegazione più ovvia è che i traduttori abbiano banalmente riportato e tradotto la dicitura Authorized Edition che si trova sulla copertina dell'edizione in inglese sulla banda rossa. 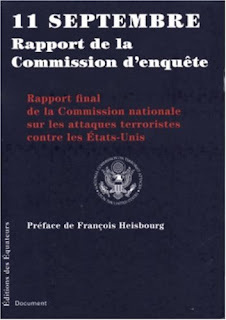 In francese esistono due traduzioni del 9/11 Commission Report. La prima di queste è stata pubblicata dalla casa editrice Éditions des Équateurs con il titolo 11 Septembre: Rapport de la Commission d'Enquête. I traduttori del testo sono Josée Begaud, Alain Clément, Bérénice de Foville, Nordine Haddad, Géraldine Lenoir, Denise Luccioni, Christian Muguet e Emmanuelle Sandron. Anche in questo caso la traduzione del testo principale è completa, ma mancano le note. Tuttavia il testo include alcune delle immagini del testo originale, quali le foto dei diciannove dirottatori, quella di Khalid Sheikh Mohammed e i disegni delle rotte percorse dai quattro voli dirottati. 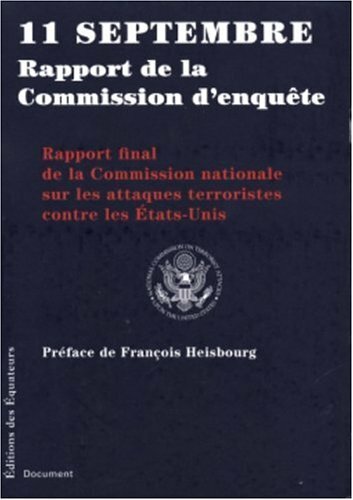 Il libro è introdotto da una prefazione di François Heisbourg che al tempo era presidente dell'istituto di ricerca britannico International Institute for Strategic Studies e che negli anni ha pubblicato molti libri su al-Qaeda e sul terrorismo internazionale. Heisenburg spiega come l'11/9 sia stato un evento senza precedenti, così come anche lo sforzo della commissione d'inchiesta nel ricostruire gli eventi che hanno portato a un attacco così catastrofico è un evento rarissimo. Heisenburg cita come unico precedente l'indagine svolta dal governo Israeliano per capire la cause dell'attacco a sorpresa subito nell'ottobre del 1973 dall'esercito del loro paese da parte di Egitto e Siria. Heisenburg riassume quindi velocemente i contenuti del rapporto, specificando che la commissione stessa ha smentito la presenza di legami tra bin Laden e Saddam Hussein, punto sulla quale la Casa Bianca insistette per anni per giustificare l'intervento militare in Iraq. In ultimo l'autore considera che le conclusioni a cui giunge la commissione devono essere utili anche per i lettori europei e non solo per quelli americani, perché il terrorismo minaccia anche l'Europa e le scelte politiche e amministrative per contrastare i movimenti jihadisti devono essere prese anche nel vecchio continente. La seconda traduzione in francese è stata pubblicata nel 2005 dalla casa editrice Alban, il volume è intitolato 11 septembre 2001: Rapport final de la Commission Nationale sur les Attaques Terroristes Contre les Etats-Unis (un'anteprima è disponibile su Google Books) ed è stato tradotto da Tatiana Pruzan e Nathalie Quintin. Il testo principale è completo, ma anche in questo caso mancano le note. Il volume è aperto da una lunghissima introduzione (oltre venti pagine) del giornalista di France 24 Loïck Berrou. Nel suo lungo testo Berrou narra la storia della commissione a partire dalla sua fondazione dovuta alla necessità di chiarire le modalità con cui sono stati organizzati gli attentati e le responsabilità di chi ha omesso i controlli necessari; l’autore cita come casi analoghi che hanno portato alla nomina di commissioni d’inchiesta l’attacco a Pearl Harbor, l’omicidio di John Fitzgerald Kennedy e l'Irangate. Berrou racconta di come inizialmente il presidente designato fosse Henry Kissinger, il quale rinunciò all'incarico poco dopo la nomina per essere sostituito dall'ex governatore del New Jersey Thomas Kean e dall'ex membro della Camera dei Rappresentanti per lo stato dell'Indiana Lee Hamilton. Il giornalista spiega poi come la commissione ha agito, ascoltando le deposizioni di testimoni a vari livelli per ricostruire quanto accaduto. Berrou riflette anche sulle conseguenze geopolitiche dell’11/9 e su come la guerra preventiva in Iraq abbia compromesso le relazioni internazionali degli Stati Uniti. In ultimo, osserva Berrou, l’11/9 è un esempio lampante di quali conseguenze possa avere la mancata collaborazione tra agenzie investigative e che la riforma di questi enti deve necessariamente superare le naturali resistenze. La terza parte di questo articolo è disponibile qui.